It’s been a long winter and there are no signs of the cold and snow letting up just yet. Sometimes, I need a little encouragement to enjoy the season…and often that encouragement comes in the form of a mug of steaming hot chocolate. But not just any hot chocolate – those opaque white instant packets are hiding ingredients that should remain well out of the range of your mouth. The Aztecs drank cocoa as part of their religious ceremonies, and the first European travellers to the New World observed the custom in the mid-1500’s. Our modern form of hot chocolate (or as some frou-frou coffee shops have been touting it, “drinking chocolate”) contain a significant amount of added sugar and are drunk more for pleasure than for sustenance or ceremony. Packing for university more than a decade ago, I bought a box of 100 packets of “light” hot chocolate mix to stash in my dorm room. I’m ashamed to say that although I finished off the box by the end of my first semester, most of the sweet silky powder went directly into my mouth and never mixed with a drop of water. If I close my eyes I can still imagine the light, granular texture and shallow, too-sweet taste. 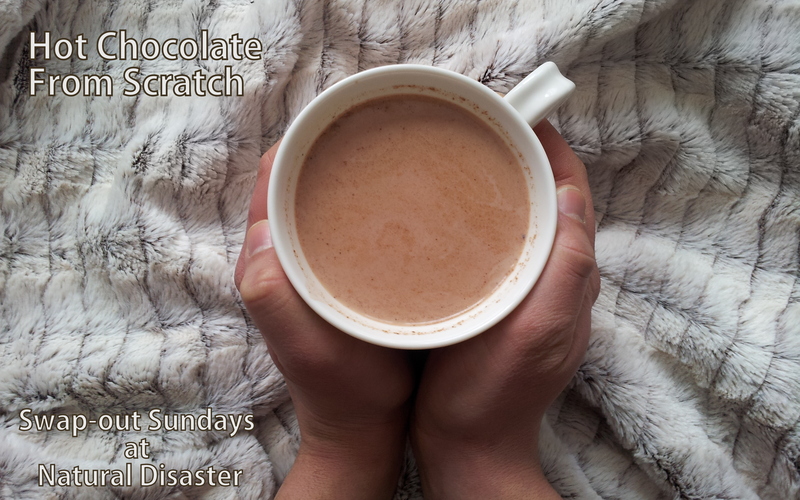 Ingredient list aside, this hot chocolate was nothing to write home about, and I think I ate more and more to try to find some kind of satisfaction from it. Carnation is the brand I see most in Canada. Here’s the full ingredient list for regular hot chocolate and their speciality flavours. Notice how “cocoa” comes fifth, after sugar, corn syrup, and hydrogenated vegetable oil. Even the more expensive organic Cocoa Camino powder contains more sugar than cocoa, as well as thickeners like carob bean gum and guar gum. And while not instant, the whole process takes only about 10 minutes on the stove. Even more, once you taste the real stuff, I promise you won’t want to go back to the powder. Sadly, there doesn’t seem to be a more natural alternative to marshmallows (which always contain corn syrup and often a host of other additives in addition to sugar and gelatin) so I encourage you to top your “HC” with a dollop of real whipped cream. Sound like a compromise? 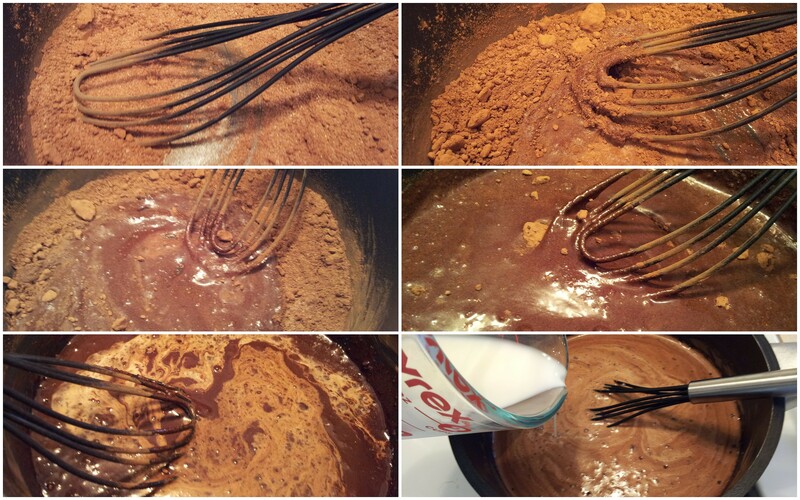 Over low heat, whisk together the cocoa powder and sugar/honey/maple syrup with a tablespoon of milk until the cocoa and sugar dissolve and the mixture is uniformly liquid and deep, dark brown. Turn the heat up to medium. Slowly drizzle in the remaining milk, whisking constantly. Continue to whisk regularly as it heats through. Do not let the mixture boil – remove from heat as soon as a fine steam starts rising from the surface, or as soon as it’s warm enough to drink. Whip up some heavy cream to top the hot chocolate, if desired. What is a modified milk ingredient? I love homemade cocoa! I gave homemade cocoa in a jar as Christmas gifts to my family. Thanks for the recipe! And the revelation of your secret guilty pleasure! I love the idea of homemade cocoa mix! What went into your jars?